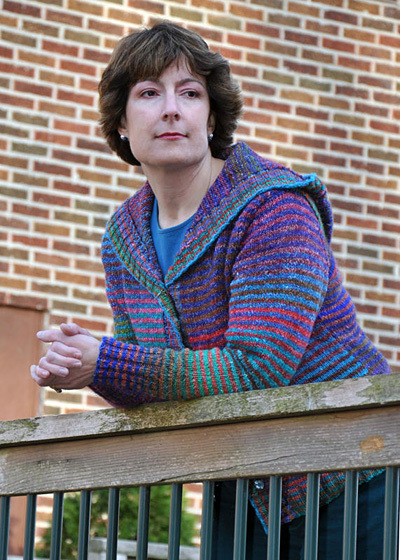 One of my first yarn purchases when I began knitting was blue/green Noro Silk Garden, to make a garter stitch shawl. As my knitting improved, I moved quickly away from the idea of square shawl in garter stitch, and the yarn waited for another purpose. After making a “Noro Striped Scarf” a few years later, I decided the blue/green Noro would make a great striped sweater, and I found some orange/red Noro to alternate with the blue/green. Even so, I did not have a particular pattern in mind, and I continued to keep an eye out for the right design. I recently latched onto the idea, again, and I decided it was time to take matters into my own hands and create just the thing. 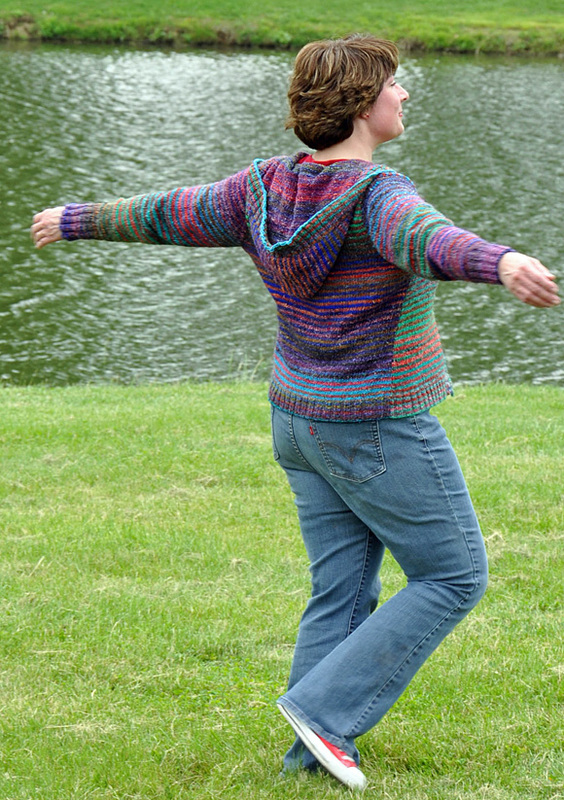 I wanted a classic, easy cardigan with simple shaping and plain stockinette, to provide a wide canvas for the color. 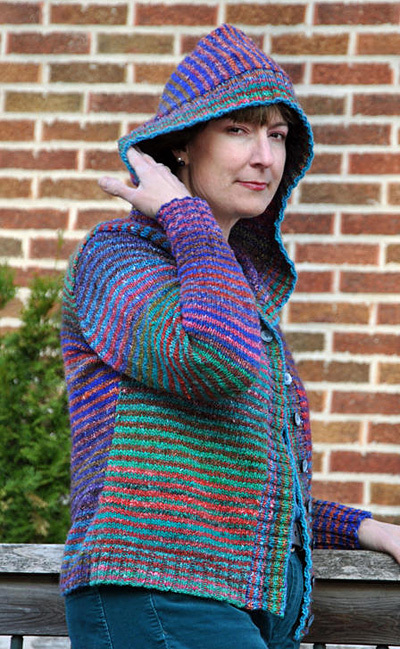 As a result, the hood is a wide and smiling version, draping when raised, and laying across the shoulders when not. The cuffs and hem have a classic rib, and the sleeves and body are gently but not-too-snugly fitted. The simple lines make it an easy and relaxing project, with the color changes keeping it enticing to knit and a joy to wear. Note: Choose a size with 1-4 inches posititve ease. Note: Buy buttons after sweater is complete to ensure correct size. This sweater has deep armholes and wide sleeves, so that it can be worn as an outer layer. When buttoned up, the front of the sweater will be 2 inches wider than the back; this provides more ease over the bust and stomach, and contributes to the drape of the hood. 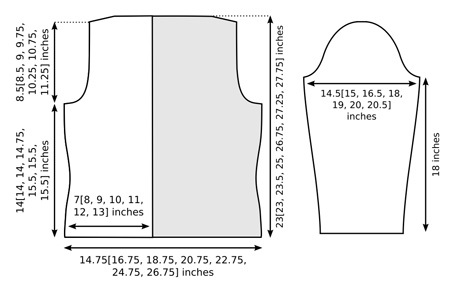 Selvedge sts (1 st at each side of each piece) are not included in measurements shown in schematic. m1p (Make 1 purl stitch): Insert left needle, from back to front, under strand of yarn which runs between last stitch on left needle and first stitch on right needle; purl this stitch. 1 st increased (stitch will be twisted). Row 1 [RS]: [K2, p2] to last 2 sts, k2. Row 2 [WS]: [P2, k2] to last 2 sts, p2. Repeat these 2 rows for 2x2 Rib. Work 2 rows using B. Work 2 rows using A. These 4 rows form Stripe Pattern. Begin each stripe on a RS row. Instructions for the Long-Tail Cast On can be found here. With smaller needle and A, CO 70[78, 86, 94, 102, 110, 118] sts using long-tail cast on. Work Row 2 of 2x2 Rib (a WS row) using A. Join B; from this point on, work in Stripe Pattern. Work 15 rows in 2x2 Rib, ending with a RS row. Next Row [WS]: P6, p2tog, *p5[6, 7, 8, 9, 10, 11], p2tog; repeat from * seven times more, p6. 61[69, 77, 85, 93, 101, 109] sts. Switch to larger needles and work 4[4, 4, 4, 6, 6, 8] rows in stockinette st, ending with a WS row. Decrease Row [RS]: K2, k2tog, k to last 4 sts, ssk, k2. Repeat these 8 rows twice more, then work Decrease Row once more. 53[61, 69, 77, 85, 93, 101] sts. Work 17[17, 17, 19, 21, 21, 21] rows in stockinette st, ending with a RS row. Increase Row [WS]: P2, m1p, p to last 2 sts, m1p, p2. Repeat these 8 rows twice more, then work Increase Row once more. 61[69, 77, 85, 93, 101, 109] sts. Continue in stockinette st until work measures 14[14, 14, 14.75, 15.5, 15.5, 15.5] inches or desired length to underarm, ending with a WS row. BO 4[4, 4, 4, 4, 5, 6] sts at beginning of next 2 rows. 53[61, 69, 77, 85, 91, 97] sts. BO 3 sts at beginnning of following 2 rows. 47[55, 63, 71, 79, 85, 91] sts. Repeat these 2 rows 2[2, 2, 3, 4, 5, 6] times more. 41[49, 57, 63, 69, 73, 77] sts. Continue in stockinette st until work measures 8.5[8.5, 9, 9.75, 10.25, 10.75, 11.25] inches from beginning of armhole, ending with a WS row. BO 6[7, 8, 9, 7, 7, 8] sts at beginning of next 2[2, 2, 2, 2, 4, 2] rows. 29[35, 41, 45, 55, 45, 61] sts. BO 5[6, 7, 8, 6, 6, 7] sts at beginning of next 2[2, 2, 2, 4, 2, 4] rows. Place remaining 19[23, 27, 29, 31, 33, 33] sts on waste yarn. With smaller needle and A, CO 34[38, 42, 46, 50, 54, 58] sts using long-tail cast on. Next Row [WS]: P4[4, 5, 5, 6, 6, 7], p2tog, *p6[7, 8, 9, 10, 11, 12], p2tog; repeat from * twice more, p4[5, 5, 6, 6, 7, 7]. 30[34, 38, 42, 46, 50, 54] sts. Decrease Row [RS]: K2, k2tog, k to end. Repeat these 8 rows twice more, then work Decrease Row once more. 26[30, 34, 38, 42, 46, 50] sts. Increase Row [WS]: P to last 2 sts, m1p, p2. Repeat these 8 rows twice more, then work Increase Row once more. 30[34, 38, 42, 46, 50, 54] sts. Continue in stockinette st until work measures same as back to underarm, ending with a WS row. Note: Use stripes as a guide to ensure that front and back are the same length. Next Row [RS]: BO 4[4, 4, 4, 4, 5, 6] sts, k to end. 26[30, 34, 38, 42, 45, 48] sts. Next Row [RS]: BO 3 sts, k to end. 23[27, 31, 35, 39, 42, 45] sts. Repeat these 2 rows 2[2, 2, 3, 4, 5, 6] times more. 20[24, 28, 31, 34, 36, 38] sts. Continue in stockinette st until work measures same as back to beginning of shoulder shaping, ending with a WS row. Next Row [RS]: BO 6[7, 8, 9, 7, 7, 8] sts, k to end. 14[17, 20, 22, 27, 29, 30] sts. Repeat these two rows once. 22 sts. Next Row [RS]: BO 5[6, 7, 8, 6, 6, 7] sts, k to end. 9[11, 13, 14, 21, 16, 23] sts. Next Row [RS]: BO -[-, -, -, 6, -, 7] sts, p to end. -[-, -, -, 15, -, 16] sts. Place remaining 9[11, 13, 14, 15, 16, 16] sts on waste yarn. Work as for left front to beginning of waist shaping. Decrease Row [RS]: K to last 4 sts, ssk, k2. Increase Row [WS]: P2, m1p, p to end. Continue in stockinette st until work is one row longer than left front to underarm, ending with a RS row. Next Row [WS]: BO 4[4, 4, 4, 4, 5, 6] sts, p to end. 26[30, 34, 38, 42, 45, 48] sts. Next Row [WS]: BO 3 sts, p to end. 23[27, 31, 35, 39, 42, 45] sts. Continue in stockinette st until work is one row longer than left front to beginning of shoulder shaping, ending with a RS row. Next Row [WS]: BO 6[7, 8, 9, 7, 7, 8] sts, p to end. 14[17, 20, 22, 27, 29, 30] sts. Next Row [WS]: BO 5[6, 7, 8, 6, 6, 7] sts, p to end. 9[11, 13, 14, 21, 16, 23] sts. Next Row [WS]: BO -[-, -, -, 6, -, 7] sts, p to end. -[-, -, -, 15, -, 16] sts. Using smaller needles and A, CO 38[42, 42, 46, 46, 50, 50] sts. Work 31 rows in 2x2 Rib, ending with a RS row. Next Row [WS]: P5[5, 5, 6, 6, 6, 6], p2tog, *p7[8, 8, 9, 9, 10, 10], p2tog; repeat from * twice more, p4[5, 5, 5, 5, 6, 6]. 34[38, 38, 42, 42, 46, 46] sts. Switch to larger needles and work 5 rows in stockinette st, ending with a RS row. Repeat these 6 rows 12[11, 9, 7, 3, 3, 1] times more. 60[62, 58, 58, 50, 54, 50] sts. Repeat these 4 rows -[-, 4, 7, 13, 13, 16] times more. 60[62, 68, 74, 78, 82, 84] sts. Continue in stockinette st until work measures 18 inches or desired length to underarm, ending with a WS row. Be sure to end with a stripe that is the same colorway as the last stripe before armhole shaping on the fronts and back. BO 4[4, 4, 4, 4, 5, 6] sts at beginning of next 2 rows. 52[54, 60, 66, 70, 72, 72] sts. BO 3 sts at beginnning of following 2 rows. 46[48, 54, 60, 64, 66, 66] sts. Repeat these 2 rows 10[11, 12, 1, 3, 3, 5] times more. 24[24, 28, 56, 56, 58, 54] sts. Work Decrease Row. Work 3 rows in stockinette st.
Repeat these 4 rows -[-, -, 0, 1, 3, 1] times more. -[-, -, 54, 52, 50, 50] sts. Work Decrease Row. P 1 row. Repeat these 2 rows -[-, -, 7, 4, 0, 5] times more, then work Decrease Row once more. -[-, -, 36, 40, 46, 36] sts. BO -[-, -, 2, 3, 3, 2] sts at beginning of next -[-, -, 4, 4, 6, 4] rows. 28 sts. BO 2 sts at beginning of next 4 rows. BO remaining 16[16, 20, 20, 20, 20, 20] sts. Weave in ends and block pieces to measurements shown. Sew shoulder seams. Place held sts of front and back neckline on needle and join yarn with RS facing; use correct colorway for next stripe in Stripe Pattern. 37[45, 53, 57, 61, 65, 65] sts. Set-up Row [RS]: K18[22, 26, 28, 30, 32, 32], place marker, k1, place marker, k to end. Increase Row [WS]: P to marker, m1p, slip marker, p1, slip marker, m1p, p to end. 2, 2, 2] times more. 53[53, 61, 63, 67, 71, 71] sts. Continue in stockinette st until hood measures 11.5[11.5, 12, 12.5, 12.5, 13, 13] inches, ending with a WS row. Decrease Row [RS]: K to 2 sts before marker, k2tog, slip marker, k1, slip marker, ssk, k to end. Repeat these 4 rows twice more. 47[47, 55, 57, 61, 65, 65] sts. Repeat these 2 rows 3 times more. 39[39, 47, 49, 53, 57, 57] sts. Next Row [RS]: K to 2 sts before marker, k2tog, remove marker, k1, remove marker. Do not work to end of row; slip last 19[19, 23, 24, 26, 28, 28] sts to circular needle. Use working yarn to graft sts on working needle to sts on circular needle. Using circular needle and B, beginning at lower right front corner with RS facing, pick up and k 5 sts for every 6 rows along right front edge, front edge of hood, and left front edge, ending at lower left front corner. Count sts; when working first row, increase or decrease 1 or 2 sts if needed to obtain a multiple of 4 sts + 2. Beginning with a WS row and working in Stripe Pattern, work 7 rows in 2x2 Rib. Buttonhole Row 1 [RS]: Work 6 sts in pattern, BO 2 sts, *work 9 sts in pattern (10 sts on right needle after bound off sts), BO 2 sts; repeat from * 6[6, 6, 6, 7, 7, 7] times more, work in pattern to end. Buttonhole Row 2 [WS]: Work in pattern, casting on 2 sts over each set of bound off sts using cable cast on method (see Pattern Notes). Note: When working cable cast on, turn work so that RS of work is facing. Work 7 rows in pattern, ending with a RS row. Using larger needle, BO all sts in pattern. If desired, steam block front band. Sew sleeves into armholes. Sew sleeve seams and side seams. Weave in remaining ends. 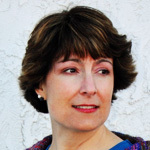 Lisa Kay designs aircraft for a living and sweaters and socks for sheer enjoyment. 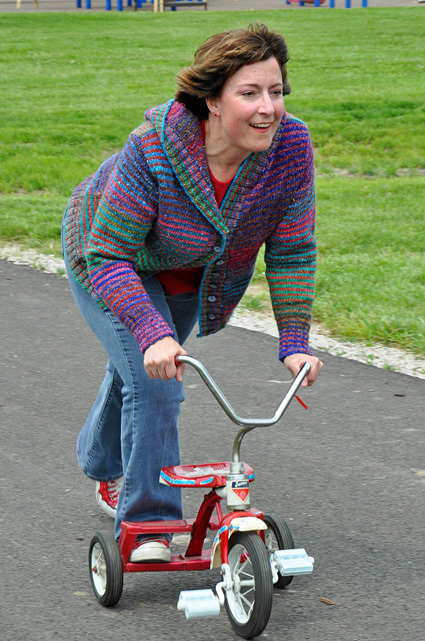 She enjoys spinning, lace, and chasing her five-year-old son. 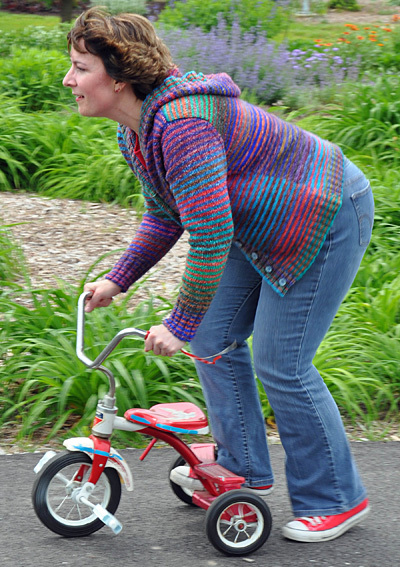 She documents her hobbies and her son on her blog.